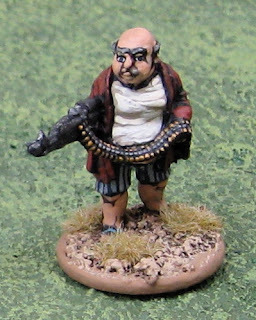 I finished up the last of the ZANLA from Eureka Miniatures. they will probably see more action as regulars in the Peoples Revolutionary Army of Timbogo (P.R.A.T.). The aforementioned ZANLA from Eureka Miniatures. Just as I was finishing these up another parcel arrived from Eureka Miniatures USA with some modern US Marines and Taliban. 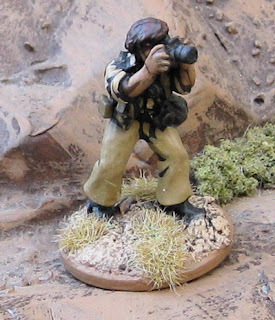 A team of Australian SAS has been operating with a team from the MACV Studies and Observation Group well behing enemy lines near the Laotian border; gathering intelligence on enemy troop movements and such. 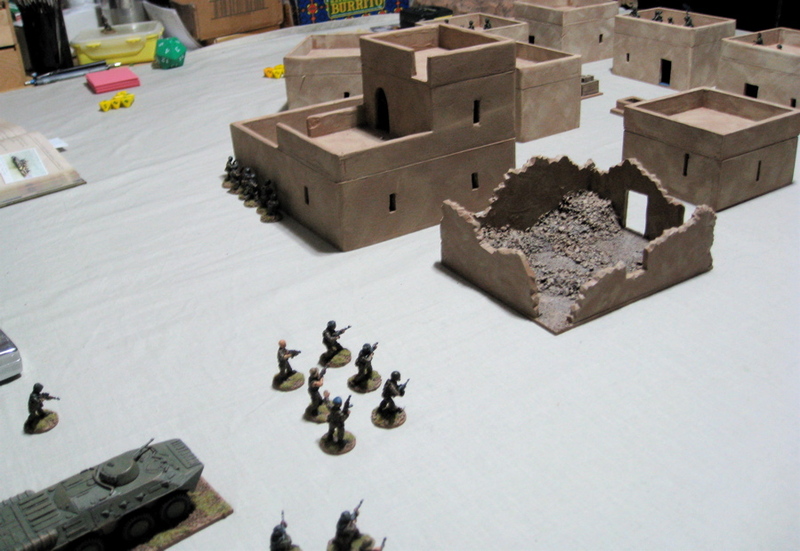 On their way to the take out point they bumped into and unexpected PAVN force! 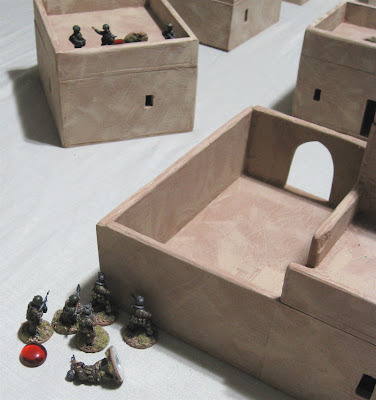 Initiative: SAS/SOG have initiative for first two turns, then test thereafter. Break Contact and get to the LZ by the end of Turn 10. I still haven’t figured these out… probably 5 for each guy that successfully makes it out, and 1 or 2 for each PAVN killed or seriously wounded….? 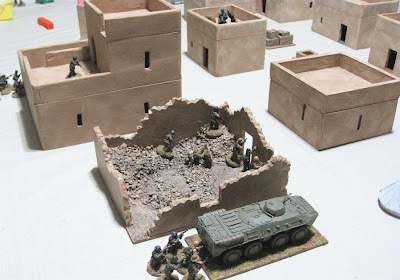 Capture the Imperialist Spies before they can escape! 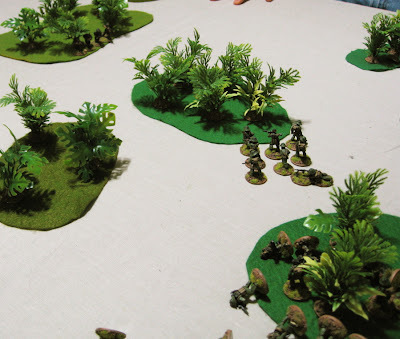 We rolled a die and determined tha trick would play the SAS/SOG forces and I would play the Vietnamese. 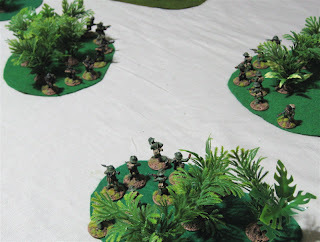 Rick started off with having the MACV-SOG team fire on PAVN Squad #1. PAVN Squads #2 and #3 reacted with fire. The MACV-SOG team fired first, but was entirely ineffective. 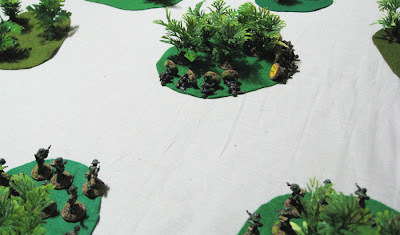 PAVN Squad #1 returned fire and wiped them out!? 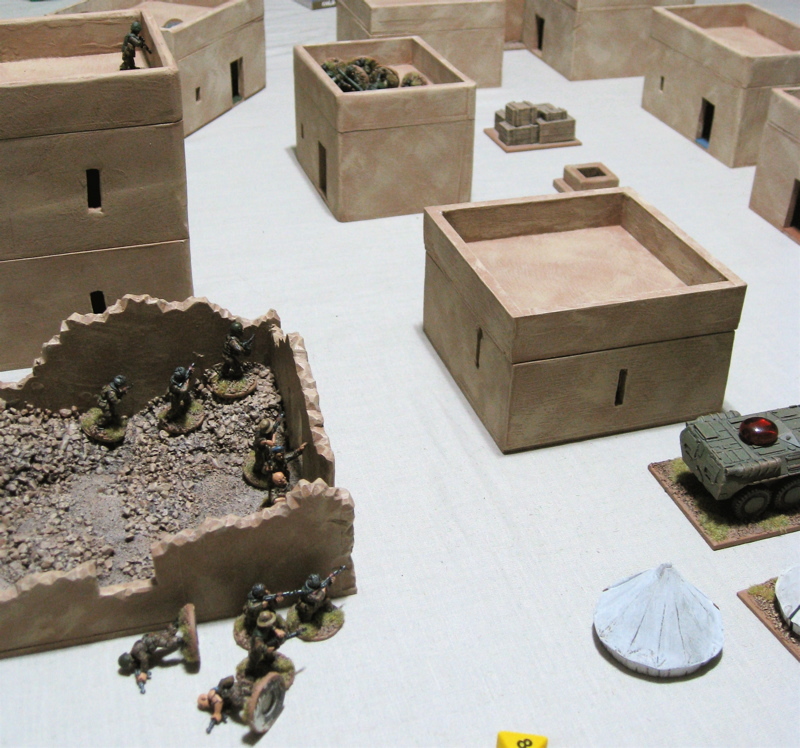 PAVN Squad #2 lost a Fire Power die for having reacted. This time Rick declared the SAS team to be on Overwatch. Then he declared the MACV-SOG team would fire on PAVN Squad #1 and then move. PAVN Squads #1 and #2 reacted with fire. The SAS (on Overwatch) reacted with fire on PAVN Squad #2. After all the reaction dice settled the order of firing was as followed the SAS fired first at PAVN Squad #2 causing 3 casualties. 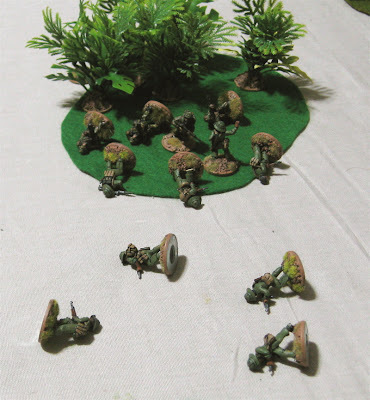 PAVN Sqwuad #2 was made of pretty stern stuff – they shrugged off those wounded and laid down some serious fire on the MACV-SOG team causing one casualty. The MACV-SOG team fired on PAVN Squad #1 with no effect whatsoever. Finally PAVN Squad #1 returned fire wiping out the rest of the MACV-SOG team!? The SAS maintained the initiative. PAVN Squad #2 checked it’s casualties and administered First Aid. They had suffered one Seriously Wounded and one Lightly Wounded. The SAS faded back into the jungle and moved over into cohesion with the MACV-SOG so they could administer first aid the following turn. Only PAVN Squad #2 had LOS and they could only react to fire so they made their move with no reactions. While the Australian SAS team was administering First Aid the Vietnamese wrested initiative of the situation from the Imperialist Agressors! 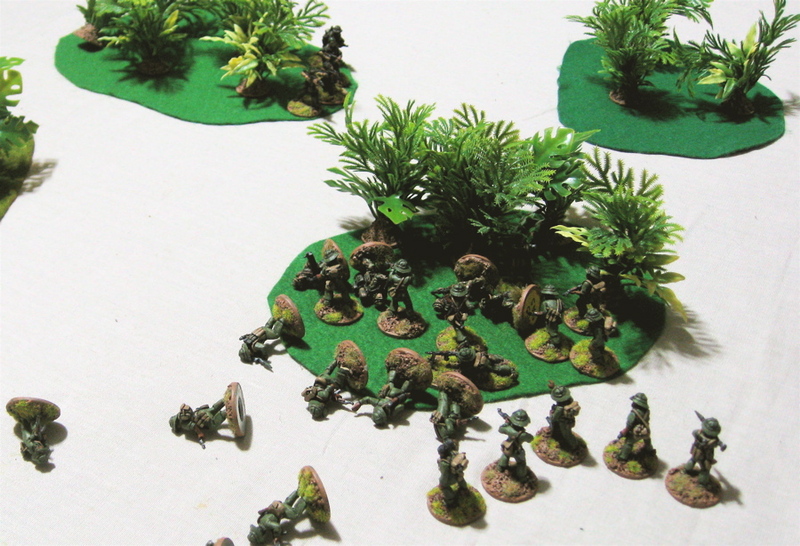 Also… The PAVN Squad, I’ve realized afterwards, wouldn’t have had LOS to the unit. 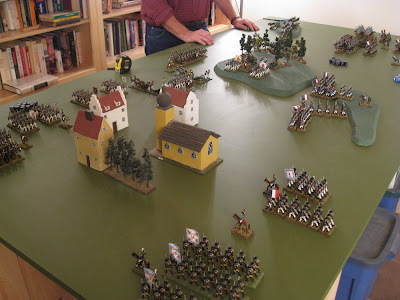 The SAS were deeper than 1” into the dense woods and thus LOS to them would be blocked… Of course it doesn’t specifically state that the target of a Close Assault has to be within LOS at the start of the move…? PAVN Squad #3 did a rapid move to get to near the brush where all this was going down. The PAVN retained the initiative! Doing a First Aid Check, the SAS had two Seriously Wounded and the other one was fine. Unfortunately one of the Seriously Wounded was the Medic!? 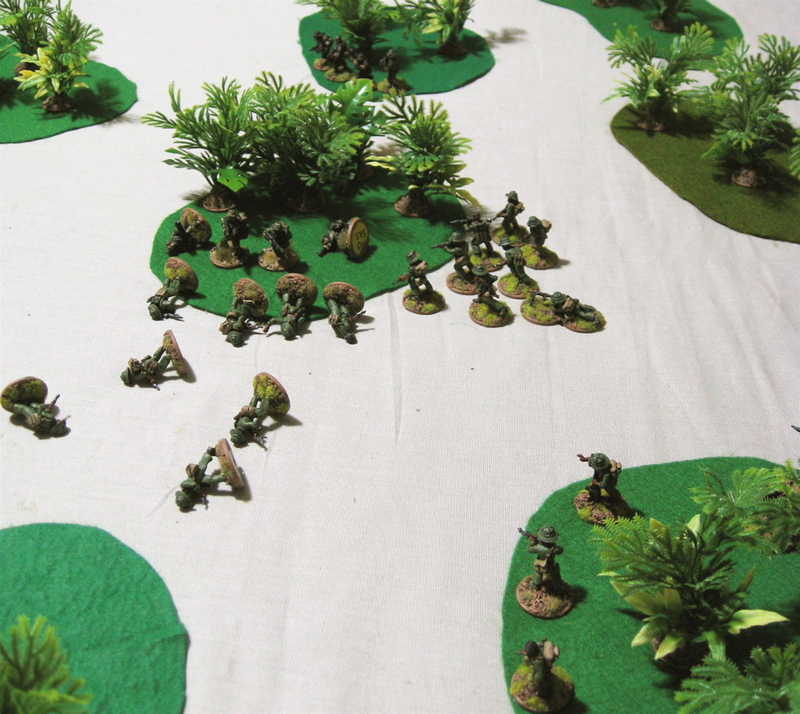 PAVN# 2 decided to split the unit and sent the two Lightly Wounded to the rear with the Seriously Wounded. PAVN Squad #3 did a rapid move to get up where they would be close to the woods where the SAS were hanging out. In the End Phase the MACV_SOG team made for cover of a nearby stand of trees and brush. PAVN Squad #3 decided to activate. They were to move into the wods with the SAS – not entering Close Assault – but just entering the stand of trees and shoot them up at very close range… The SAS decided to react by shooting and then running away… I can’t remember how the reactions went… I think the SAS won the reaction so they got to fire first but were ineffective. 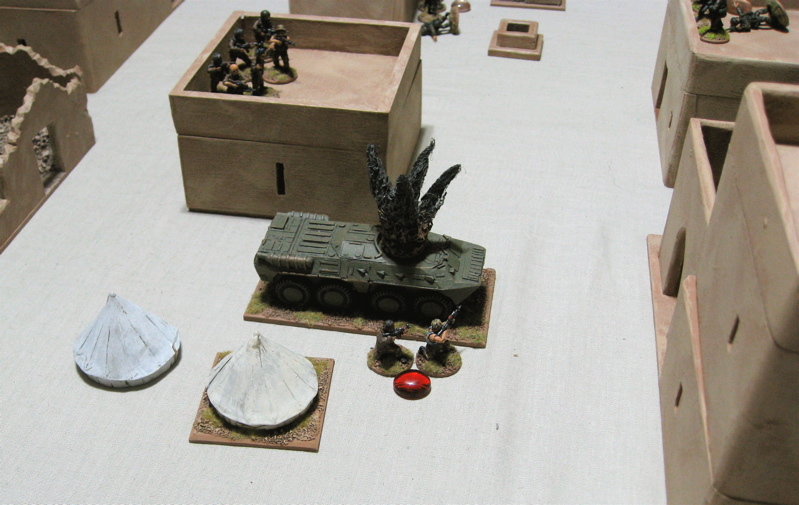 Then, I think, the PAVN went (because they get to respond to reaction fire, because they are regulars, right…?). The PAVN’s fire wiped out the SAS. They then completed their move into the woods. PAVN Squad #2 then also moved up to the woods. 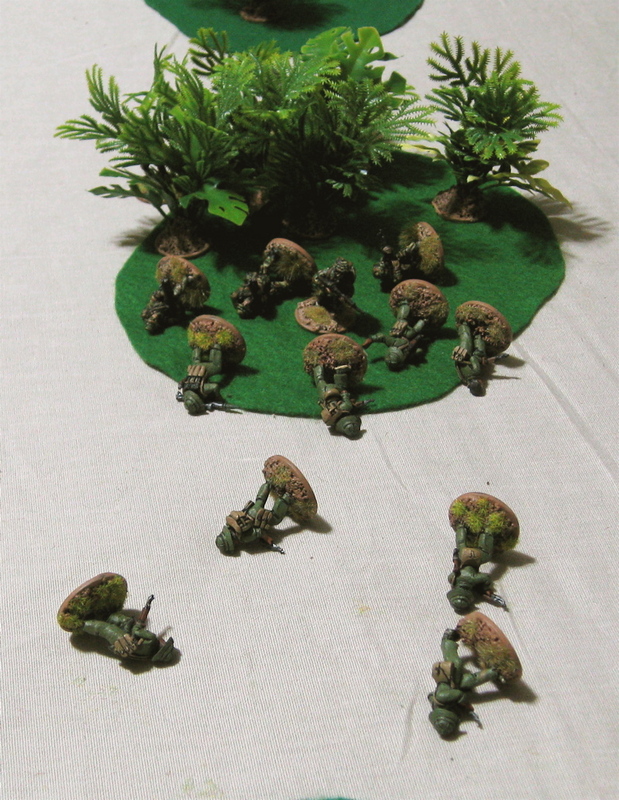 In the End Phase the MACV-SOG team moved from one bit stand of trees to antoher. While the PAVN were sorting out SAS casualties and prisoners in the woods the MACV-SOG once again seized the initiative! The two SAS troopers injured in the previous turn’s firefight were also Seriously Wounded. All were now POWs. The MACV-SOG – completely out of LOS to anyone – moved to the far edge of the wood they were in. PAVN #3 also moved up to the edge of the wood that they were in. 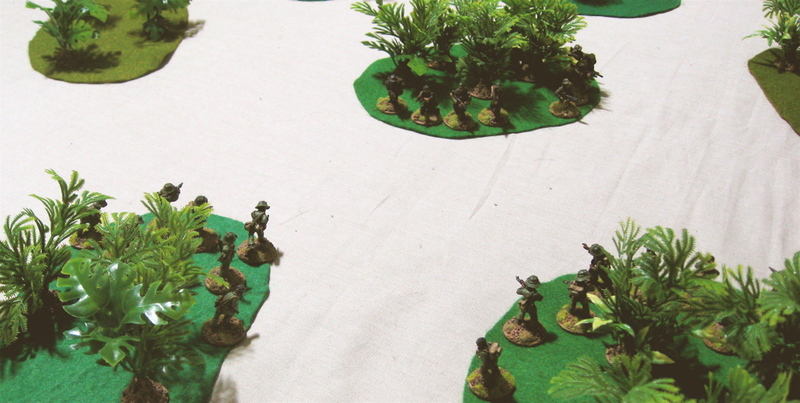 PAVN Squad #2 moved further into the wood and took control of the Australian SAS injured POWs. The SOG team retained the initiative. 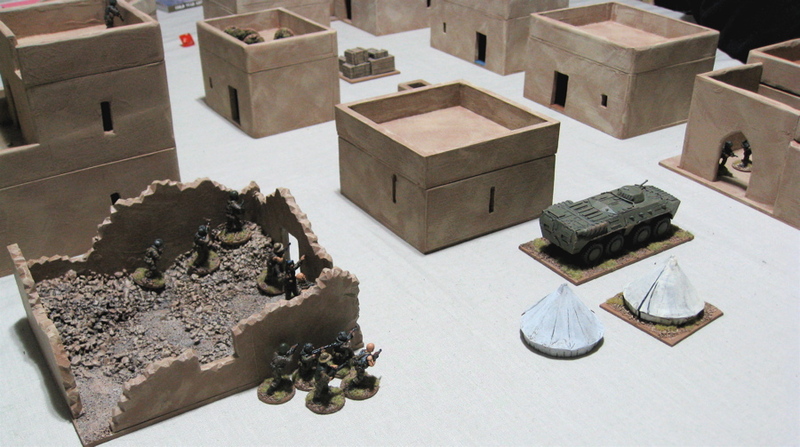 The SOG team made another dash from one bit of cover to another – not that anyone had any LOS on them. 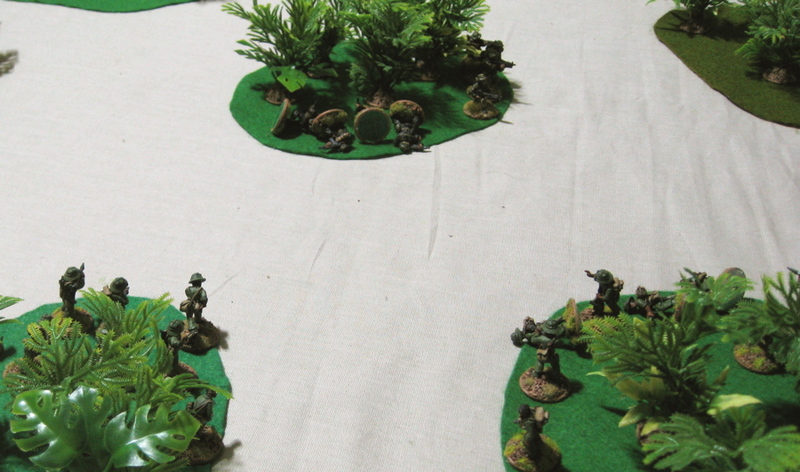 In the End Phase PAVN Squad #3 moved out of the woods and took cover behind the wood opposite. The SOG team still had the initiative. 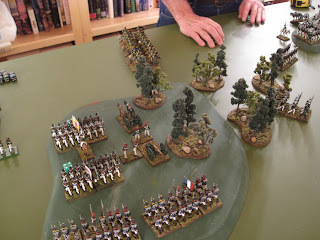 The moved to the far side of the woods they were in which brought them to the edge of the LZ. Since I had only stated the SAS/SOG teams only needed to get TO the LZ by TURN TEN, we called it there as the next turn the SOG team would be into the LZ. 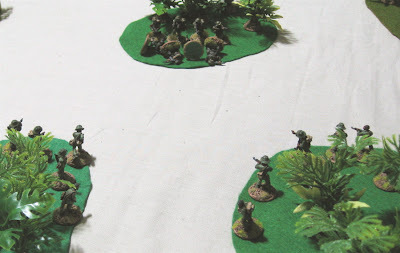 I also realized afterwards that what I should have done was to make the SAS/SOG Stealthy or Elusive – so they could have started the fist turn hidden and just tried to fad away – forcing the PAVN to throw themselves into the SAS/SOG position to find them, allowing the SAS/SOG forces to ambush them turn after turn… that would have REALLY balanced things out a bit. Still learning… Sometimes the more I read the rules and play the game the more confused I get… They seem so intuitive… yet I can’t get my head around some things… Maybe I’m just an idiot…? After a series of “border incidents” and a number of “terrorist bombings” within the Soviet Union, the Soviets have launched a full-scale invasion of neighboring Burkhadurkastan claiming they have been harbouring and training the terrorists operation within the Soviet Union…. (It has nothing at all to do with the recently discovered vast oil reserves in the border region of Buhdurkh). A coalition of western nations, led by the British, outraged by the Soviets brazen infringement of Burkhadurkastan territorial sovereignty have pledged support to the beleaguered Burkhadurkastanis (whether they want it or not)! (It has nothing at all to do with BP purchasing exclusive rights to exploit the recently discovered vast oil reserves in the border region of Buhdurkh). Elements of the Black Watch have moved into the Eastern part of Budurkh and begun hastily preparing defences for the expected soviet swing toe the west. 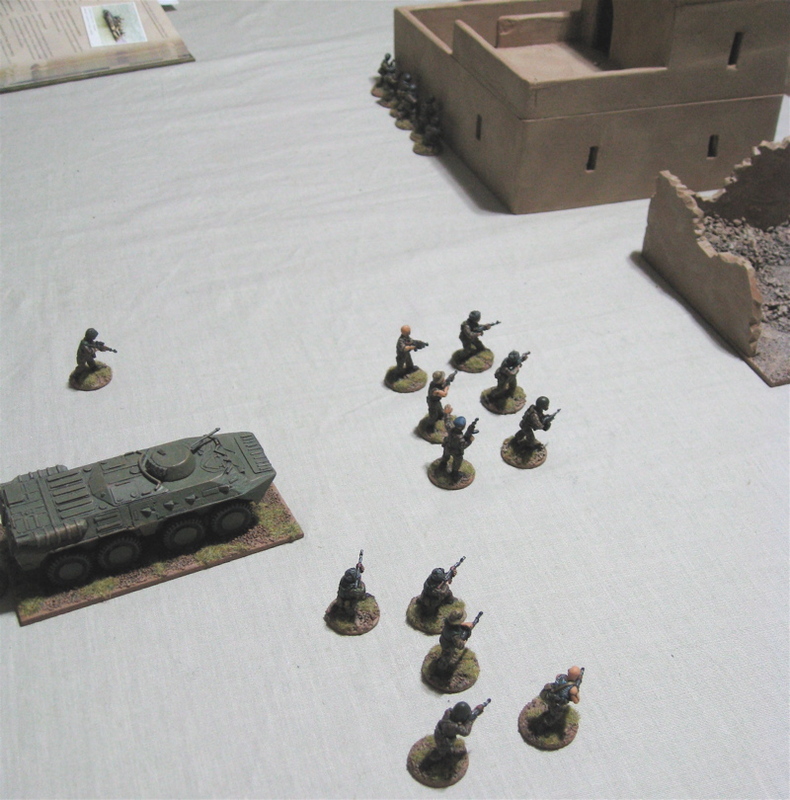 Initiative: Soviets have initiative for first two turns, then test thereafter. 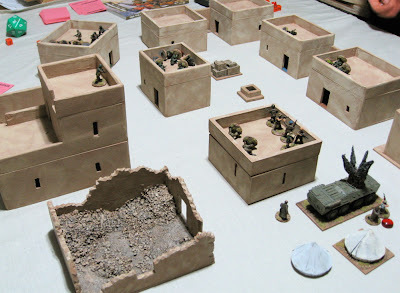 Occupy the village of Guburkh and prepare defences to hold off the advance elements of the invading Soviets. Push through the village of Guburkh and expel any resistance you encounter there. 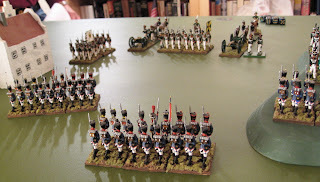 As the British Victory Points above.. really just playing to figure out rules... haven't really got me head around designing balanced objectives and forces and whatnot. After we'd worked out who would have what, Christian decided to take the defending British and I took the attacking soviets. The soviets rushed to the edge of town. No reaction from the British (or Scots, actually…). 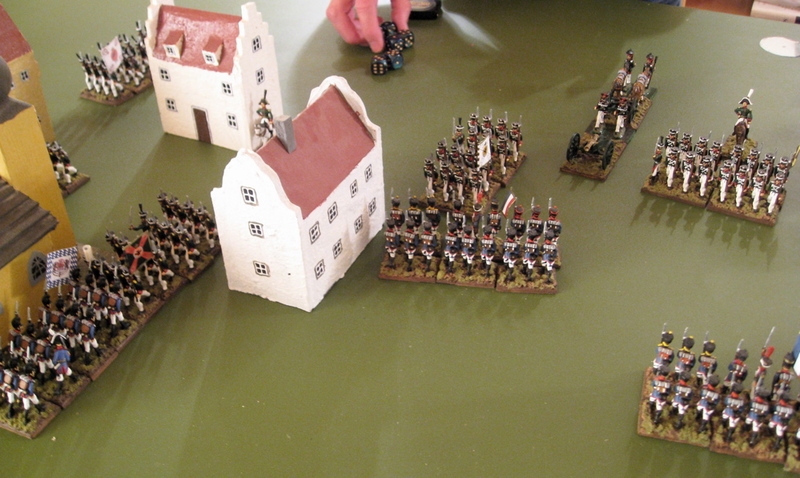 The Scots move up to new positions in the End Phase. 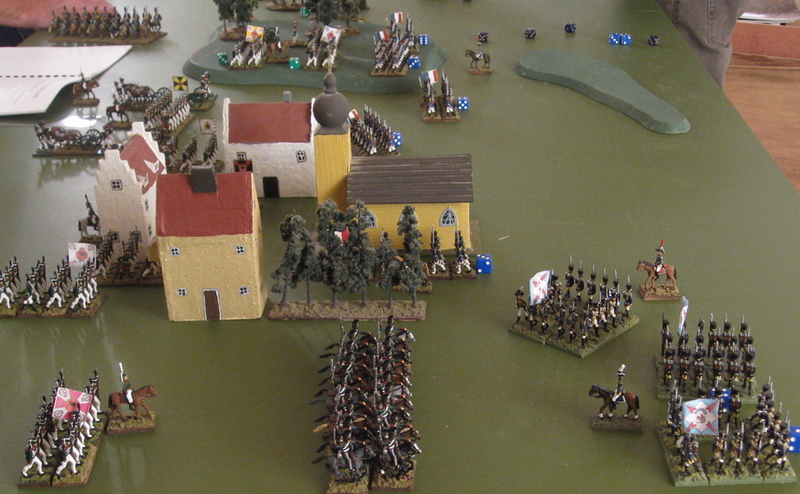 Soviets and British Exchange fire on the south end of the village. 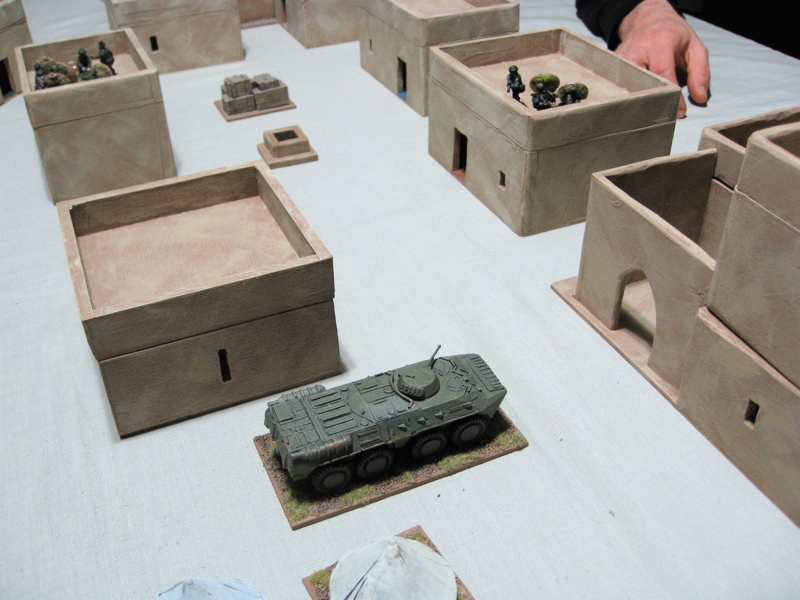 Both take one casualty, the Soviets are pinned. The other soviets moved up taking cover in and around the destroyed building on the Northeast endge of the village. Two British and Two soviet teams did first aid checks to see what happened to their downed comrades… The soviets apparently had one seriously wounded soldier and the other was okay… I don’t seem to have taken note of what happened to the British. 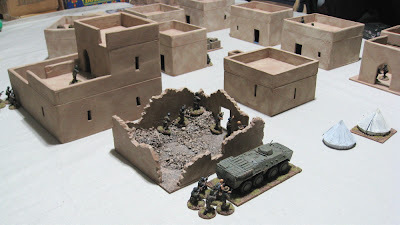 There was some attempt at exchanging of fire in the middle of town – which brought out another FoW card – Air Strike – an Su-25 Frogtfoot operating in the area decided to help out and dropped a bomb on the building in the center of town where the British were firing from – wiping them out. With the threat in the center of twon reduced the BTR-80n moved up. I have noted that the soviets did a first aid check and had two more seriously wounded…? Though I’m not sure WHERE they took those casualties…? Antoher British unit apparently had a Serious Wound and a Light Wound – I’m guess this, and the Soviet mystery casualties were among the teams at the south edge of the village that were exchanging fire. The BTR-80 fired at Brits in the building immediately to their front. The BTE fire was ineffective, but the British return fire took out the vehicle commander (who was unbuttoned)! The Soviet vehicle commander turned out to be seriously wounded. The British Lieutenant was okay, the medic Lightly wounded, and another was KIA. I’m not sure what else was going on in the turn…? The Carl G Gunner lit up the BTR-80! The Soviets moved up in the center and apparently shot up some more Brits… somewhere….? Among the British Casualties taken prisoner on the south end of town two were Seriously Wounded, two were Lightly Wounded. I can’t remember what else went on in the last turn… Things were going very badly for the British…. Among the other Fog of War cards that were in the discard pile (that I can’t remember when they came up were: Shuffling the Stack (The Brits were no longer allowed to call on any further air strikes… had they been allowed to do so…), Fire! Fire (a building occupied by some British burst into flame and had to be abandoned), A Break In The Clouds (negating any previous weather related FoW cards), and “Should We Turn This On?” (Something to do with Ground Surface Radar - I had to make a TQ test – failure would have meant the Brits got a free Heavy artillery fire mission on one of my teams, bu,t as I passed, it just meant the Brits couldn’t use Out of contact Movement). I’m kind of prepping and priming a number of things that arrived this week and jumping around – back and forth between Africans, British SAS and a half dozen assorted vehicles in various stages of assembly and paintage…. Who knows what I’ll post next… Maybe it’ll be a report of Saturday’s game! I'm on the countdown to 1000 posts. This is apparently post #990. 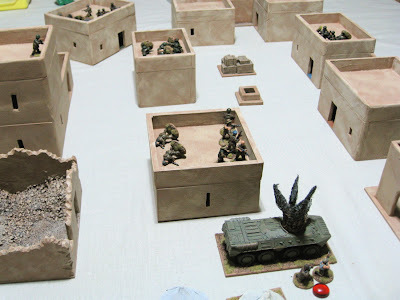 Last week I played a little skirmish scenario with the kids set in of Timbogo; the fictional African nation that has been the setting of many more modern wargames and adventures on the “Dark Continent”. Expedition to Timbogo at Savage Timmy’s Playhouse. I have one more game report to catch up on, then hopefully back to some painting! A few more modern items… I actually finished these up a few days ago, but then just didn’t get around to posting them. 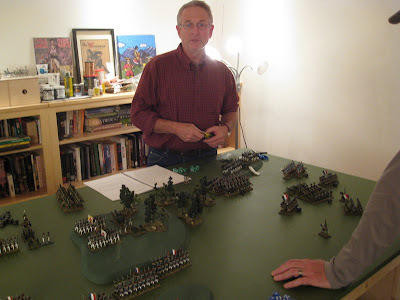 Which was fine because it left that post with all the pictures of John’s pretty toy soldiers at the most recent post for everyone to see. If you haven’t do have a look at them – they are quite the spectacle to behold scroll down or click “previous post”. 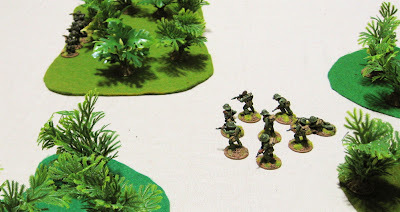 Rhodesian Light Infantry from Eureka Miniatures. 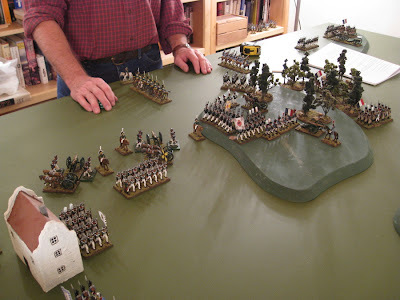 Our good friend Curt was in town, so John decided to host a game of Napoleonic Ever Victorious Armies. His Napoleonic armies are "old school" 30mm figures - some old Scruby figures, others he's modeled and cast himself. All I know is they wore very pretty uniforms. 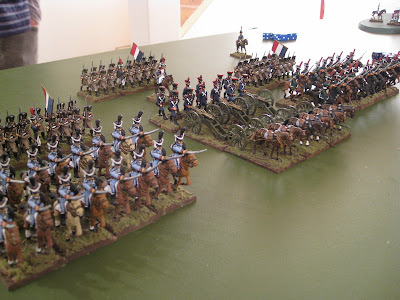 I mean, check out these french lads in the blue coats, don't they look fabulous! Fashion-wise, we had the Russians beat from the get-go! And there was just so many of them.. and all dressed the same!? Seriously, do they go to balls dressed like that? Here the game is finally underway... Gary's boring Russian cavalry came charging up the flank, so my chaps (I think they might have been Polish...?) formed square and taunted them. 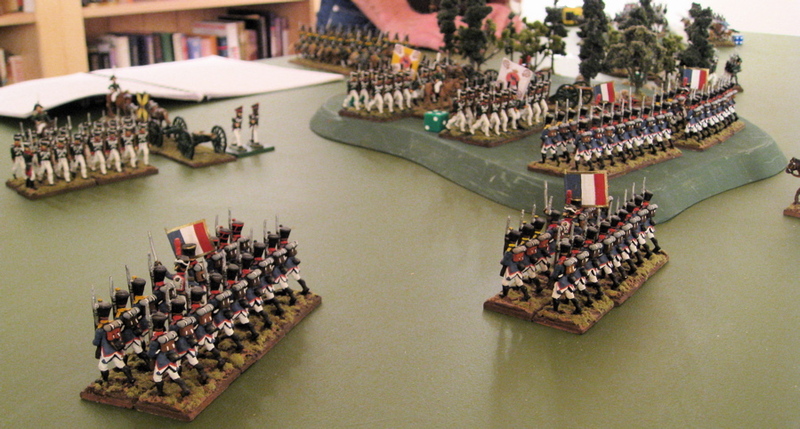 Down at the other end of the line the Bold and Courageous French Cavalry storm the Russian guns on hills conveniently located in the Russian Deployment Zone. Our Commander-in-Chief; the spry and dashing Marschall Curt! A fine day for a stroll through the meadows of Poland... or was it Lithuania...? Wherever it is, the wine is terrible and the women not much better. Why were we here again...? 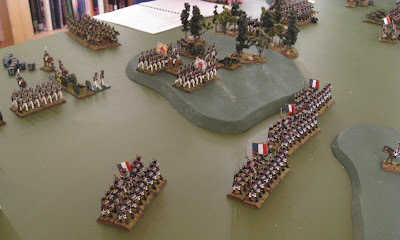 Ah, Napoleon. It was his idea. Clever lad. I'm sure there's a good reason for it. 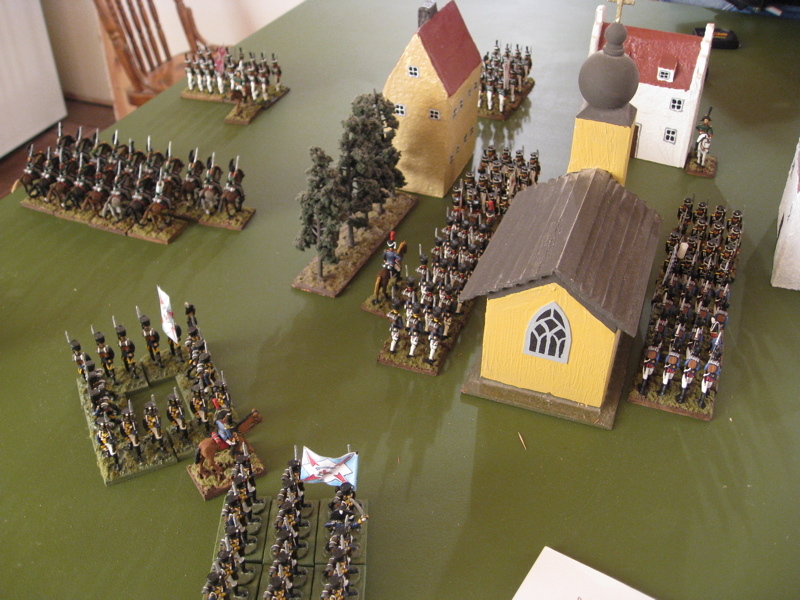 Opposing forces enter the village. It was rumoured there was a whorehouse within so some of the fiercest fighting of the day was here in the streets of this picturesque Polish village... or was it Lithuanian...? More french lads marching about in a field. 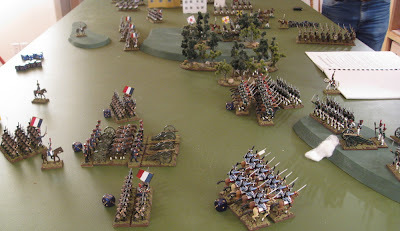 the bold and fearless French charge the hill in the center of the field of battle and capture the guns! Huzzah! More guns being captured by the pretty boys in blue. 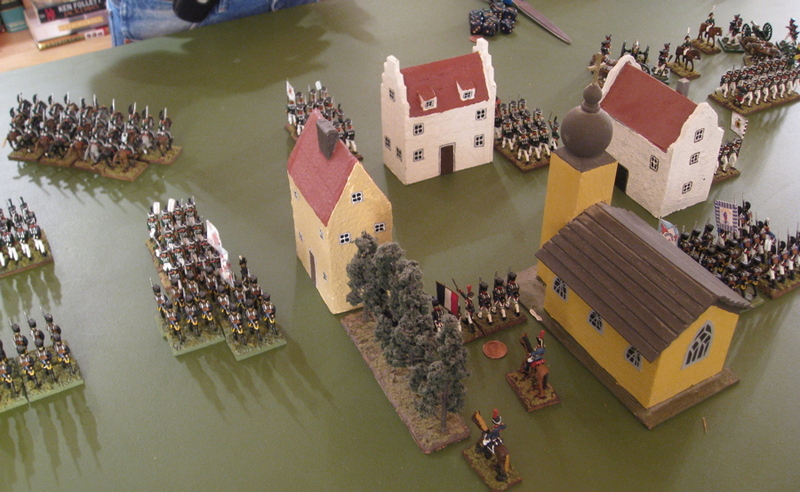 Fierce fighting in the middle of the village. Fierce. There was hissing and scratching and slapping with gloves and I think someone's buttons even got torn off. 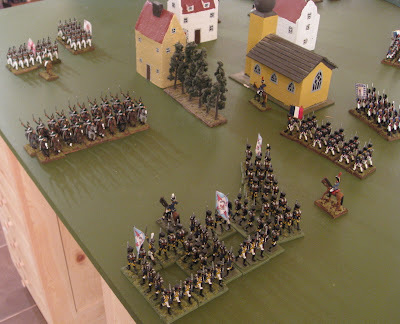 So fearsomely determined were the French in the village the Russians fled from it - leaving the whorehouse in possession of the truly better men. 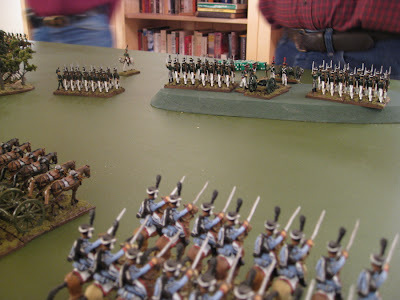 Russian cavalry can also be seen fleeing from our glorious Polish(?) allies. Hmmmm... I think we won. We certainly got higher points for presentation and technical performance. The Russians had all the finesse of a sledge hammer and the fashion sense of a mule. Big thanks to John for hosting the game and it was great to see Curt again. 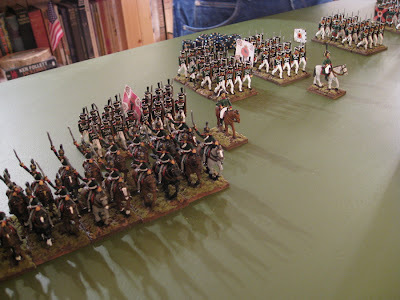 MORE game reports. It truly has been a week of mad gaming! ?